At first glance, William Bradshaw is ordinary to the point of nondescript. At second glance, the view hasn't much improved - he’s just another badly-dressed bloke burdened by student loans and desperate to find a job. His very insignificance, however, makes him the perfect candidate for the one job he never knew existed and absolutely doesn’t want - to be the king of a motley rabble of goblins in a strange new world. In between exploring (and trying to escape) his lousy kingdom, Will has to contend with good-for-nothing vassals, malfunctioning magical treasures, and the pitying disdain of every non-goblin in his vicinity; he certainly doesn’t need an idiotic fellow king with his obnoxious wife-to-be complicating matters even further by threatening war! Can Will get rid of these pesky distractions long enough to find a loophole in his job contract and leave this dump? Will he even survive? Read Arthur Daigle’s William Bradshaw, King of the Goblins to find out! 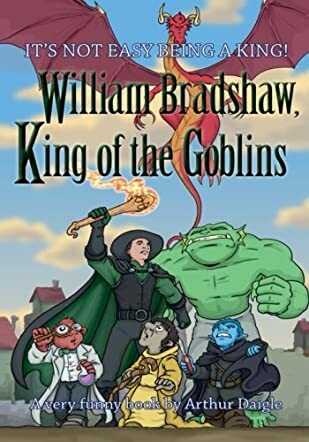 William Bradshaw, King of the Goblins is a simple, yet classic tale of the underdog turned victorious. Readers are taken on a wild ride as Daigle flouts convention and stereotypes with mischievous glee - the supposedly repulsive goblins turn out to be quite endearing in their obnoxiousness, while the beautiful Princess Brandywine and the majestic King Kervol emerge as the true antagonists. Will is the perfect reluctant hero, who makes up for his straight man act and nonexistent talents with a good dose of cunning and common sense. All in all, I rate it a highly satisfying and heartwarming read.